A heartfelt and highly personal account of Pura Regalado, who overcame the manifestation of a negative energy emanating from the collective unconscious to then embark upon a life of enlightenment in the world following her experiences. She welcomes all who wish to debunk her story. Through conveying her visions of telepathic communications with a mysterious sentient entity , Pura believes it is her mission to enlighten the world. She offers innumerable prescription of how this can be attained in this extraordinary account of her life experiences. Pura is critical of how Christianity has been misrepresented through the centuries. She believes distortions abound so she seeks to correct these misapprehensions. Here you will discover a very intense, wide ranging, colorful, kind spirited yet provocative book, based on a personal spiritual connection with God, as Pura Regalado enlightens and teaches us the path she has discovered. S-Theory is the first new theory of personality of the 21st century, coming into existence almost 50 years since the last major theory of such was introduced. S-Theory defines and explains emotional intelligence. For us as a human species to productively change from our frequent cyclic tendencies toward violence, greed, and oft-accompanying ruin (expressed through the recurrent rise and fall of civilizations), we must develop motivation to change—motivation induced through knowledge. 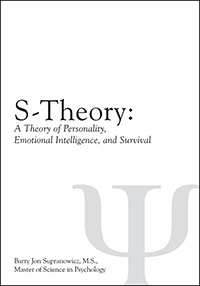 S-Theory allows such motivation to usher forth in readers by explaining, and allowing a revolutionary new understanding of, what we call personality and emotional intelligence—the essence of what makes us (and other life forms) up. It explains how such developed and evolved (with particular emphasis to human functioning). Understanding S-Theory will allow the reader to evaluate the level of personality and emotional intelligence they (or others) possess—in functional easy-to-measure behavioral terms. Such theory will also allow the reader a clear perception of what adaptive and maladaptive behavior is, how these develop, and how to change them (if desired). It is hoped by the author that the knowledge brought forth from within this manuscript will arouse in the reader an epiphany of awareness—and lead to arousal of motivation sufficient enough to create productive individual change, leading to ultimate enhancement of future human (and non-human) survival on earth.